Universal will be there to help support your church throughout the entire directory program. Here are program materials for your use. Please feel free to download and print these items as needed. Universal's church consultant will conduct an in person organizational meeting with your volunteers to ensure the success of your directory program. 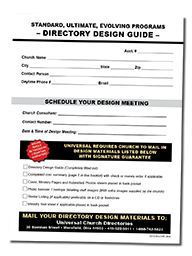 Your church consultant will also conduct an additional in person design meeting to make sure your directory is customized to your church and is completed in a timely manner. © 2018 Universal Church Directories. All Rights Reserved.